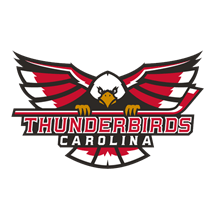 Winston-Salem, NC – A capacity crowd at the Fairgrounds Annex were on pins and needles through much of the game, but two third period goals from the Thunderbirds gave Carolina a 3-1 win over the Mentor Ice Breakers Saturday night. The first period was dominated by Carolina but it took over 18 minutes to solve Mentor netminder John Sellie-Hanson. The opening goal came off of a Jay Kenney shot that was sent high in the air after a stick save by Sellie-Hanson. Joe Cangelosi patiently waited for it to fall to crossbar level and then batted it in making contact just underneath the crossbar and hitting twine for the game’s opening goal. A referee’s conference after the play eventually kept the goal on the board. With a slim 1-0 lead in the locker room Carolina kept their foot on the gas pedal, but shockingly Mentor would tie the game with a shorthanded goal from Gordy Bonnel. Bonnel kept his point streak going to 16 games with that goal and the Ice Breakers did something that hadn’t been done since the first game of the season, score a shorthanded goal on the Thunderbirds. The second period wouldn’t go without some more fireworks though as Mike Baker and Matt Kadolph dropped the gloves for an intense fight that would end with blood on the ice and a delay in the game to clean it up. Both men went off to the locker room for repairs. Kadolph had to change his number after the fight due to blood on his #3 jersey. With a 1-1 scoreline going into the third period a crowd of 3,000+ waited and waited and eventually were rewarded when Tommy Mahoney scored on a deflection that went through the legs of Sellie-Hanson and sent the Annex into a frenzy. About four minutes later Jan Salak was left all alone in the slot on a power play after some great tic-tac passing involving Baker and Jiri Pargac and the game had its final scoreline. Christian Pavlas stopped 27 of 28 shots he faced in the game for the win, John Sellie-Hanson took the loss for Mentor stopping 38 of 41 shots Carolina put on him. The Thunderbirds now head to Mentor to finish off this three games in three days stretch and will look to keep their win streak alive on the road against the Ice Breakers. Puck drop is at 4:35 with a 4:10 pregame show on the Carolina Thunderbirds broadcast network.